Nintendo’s introduction of the Pokémon Trading Card Game for iOS earlier this week presented us with renewed hope that the gaming giant may finally bring the likes of Super Mario Bros. and Zelda to smartphones and tablets, but for the time being, we’ve always got emulators. 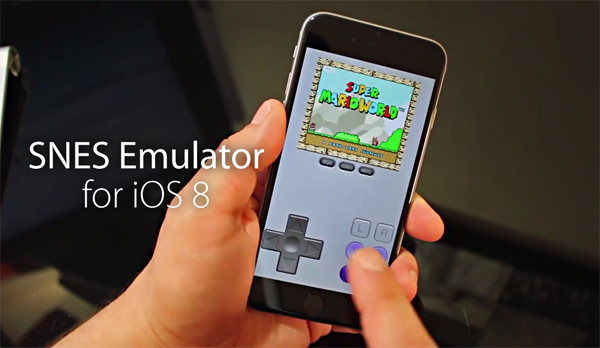 As far as iOS is concerned, normally the only way to run titles from the likes of the NES and SNES is to jailbreak, install one of a number of emulators, and proceed to run the ROMs, but here, we’re going to show you how you can enjoy SNES games on iOS 8 without a jailbreak. SiOS enables iOS 8 devices to play SNES titles, and even though there’s no current jailbreak on the new Apple mobile software to speak of, this is largely irrelevant in terms of getting this tool up and running. It works on any device running iOS 8, including the new iPhone 6 and iPhone 6 Plus, as well as the iPhone 5s / 5c / 5 / 4s, iPod touch 5th-gen, and every iPad aside from the very first 9.7-inch model. Step 2: Hit the Apps tab, scroll down to SiOS, and then Install. After a few seconds, you may need to hit Install again. Step 3: Fire up Settings > General > Date and Time. Toggle Automatically Set to OFF, and manually set your date to two months previous. If, at any time, you get an “unable to download” popup, just keep tapping on Retry. Once you’ve set the date back, installation should proceed. Step 4: Once SiOS has finished installing, open it up and tap Trust when prompted. That’s it, the emulator installation process is complete at this point, and now you’re left with hunting down ROMs to get your game on! It’s a neat, smooth little emulator, and because it grants users jurisdiction over how the controls are set, it doesn’t compromise the actual experience for the novelty and nostalgia of playing SNES titles on iOS. Here’s the video, and as ever, do leave your comments below. How about plain NES? Marioworld! Nah, the jailbreak is better because you can have emulators apps on your iPhone. A non jailbreak.. you only have one emulator app and if you want other emulator app then you have to deleted it first. Also, you have to time travel backward to make it work too. Annoying, really. A jailbreak is the best option to use for those emulators easily. Correct me if I am wrong. Sorry about my English. This is crazy. You can install a bunch ofp apps with this date trick. Popcorn Time, iTransmission, Movie Box, ect, ect. This is a big problem for Apple. I’m sure this will be patched really quick. Not really. This method has been available since iOS 5 (a few years ago). They install developers certificates for “test” apps. Apple can’t take that away or they’ll have to change their whole certificate system. Does anyone know the significance of putting the date back? What does this actually do? according to xbmc it can’t be because it uses custom api’s?? TBH I didn’t install it. I did see it somewhere though. Let me see if I can dig it back up and install it. Correct, it can’t be in the App Store because of use of unpublished APIs. But that doesn’t prevent a developer from signing it and sideloading it anyways. Am I the only one that cannot use multitouch when playing? I mean keep running and jump at the same time. Nope. Installing apps with this method puts them in a sandbox just like App Store apps. So they don’t have root access the way a Cydia apps can run with a jailbroken phone. So apps like TetherMe aren’t possible. I installed the app and did the back to the future and now I accidentally my whole iPhone 6 plus! Please help me to fix it! Why did this happen? My husband is going to kill me! HELP! I ran into, why I think they ask that. I tired installing with date set back in time but it would never take. So I let my date be automatic but download and switch my date. By that time it came up and when I hit retry, it went through right away. I tried this multiple times and this was the only way for me. It seems through the iPad I needed updated time just to access the download portion. After that, it seems to not care. With English like that I guess you can’t explain to him either. Pick a nice coffin…….. I go to the funeral place today to pick one but I still need to fixed the iPhone of my husband. Please help! He buyed it 2 weeks ago from USA and paid over $2000 to have early, help please! Can you helping me? I accidentally the whole phone when I tried to get the Super SNES on my husband phone. He get home soon! You still have not explained what you did. The most important part you left out. “Accidentally my whole phone” means nothing to anyone on this page. What did you do? It is the iPhone 6 plus. I accidentally the whole phone when I tried to go back in time to put the Super SNES app for my husband. I didn’t mean to do it, I’m sorry. Can you please helping me for to the fixing of it? I seeing you have an iPhone 6 two, please for the helping? after i set the date back, the app says loading and freezes there, any ideas?